The Four Seasons building towers over the Yorkville quarters where Torontonians and tourists enjoy good food and high fashion. If you love luxurious weddings, Four Seasons is the place where you should get married! The phenomenal cuisine, the interior design, the impeccable service and friendly and professional staff, not to mention the luxurious spa and other amenities will bring your wildest wedding dreams to life. Four Seasons Toronto will pamper you in a way you will never forget. A wedding is completed with a sneak out blitz photo shoot in Yorkville and an opportunity to eat your wedding cake incognito among the stars. On this autumn wedding day, we were supposed to shoot outdoors, but the weather did not collaborate. After the tea ceremony that occurred in the Aria East room, we were supposed to go out for the creative photo shoot and family photos. However, when the bride and groom jumped in the limo, it started raining cats and dogs. Sensing a good opportunity for an artistic photograph I asked the limo driver to stop right then and there in front of the Four Seasons. Afterwards, I directed my second shooter to jump in the front seat and bounce the flash so I can create a good direction of light towards the bride and groom. In essence, this is a candid wedding photo because I did not provide any instructions to my bride and groom. As such, they looked outside the window and chatted. Most Toronto wedding photographers would asked the bride and groom to roll down the windows so that they can capture clean shot of the couple. 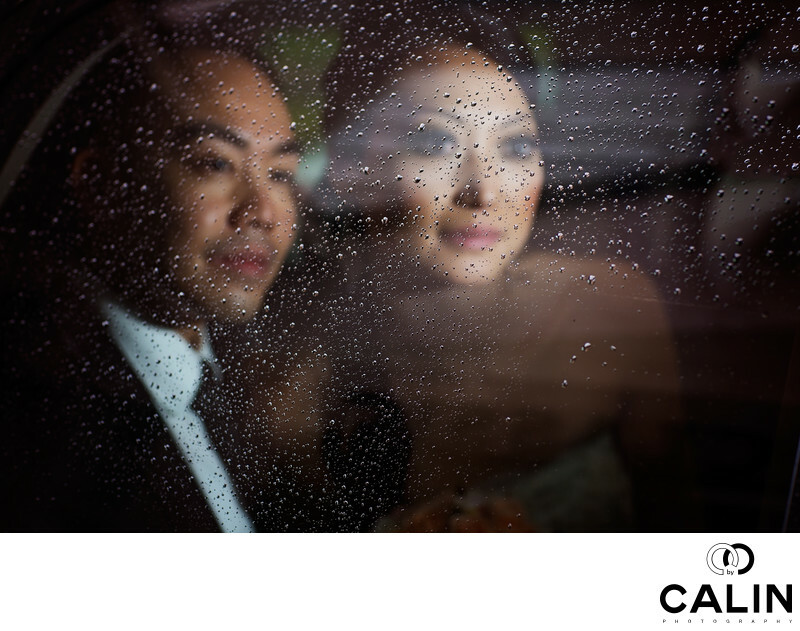 However, I wanted to create something different so I focused on the raindrops on the window, which renders the newlyweds out of focus. After taking a few frames and making sure I got the image I wanted, I invited the couple to go back to the hotel so we can photograph indoors. Fortunately, the four seasons offers plenty of spots that constitute perfect backdrops for wedding photographs. The lobby across from the reception desk and the walls in general feature pieces of art that act as elements of interest in photos. I'm usually very critical when it comes to my work. However, I love this image. The composition, the light, the mood are outstanding. The bride and groom are placed on the left of the frame looking towards the right. That breathing room and the negative space in front of the couple creates tension in this wedding picture. The image contains multiple layers. In the foreground the raindrops are in focus but our eyes move quickly towards the bride and groom. It is the humans nature that we immediately focus on the recognizable features, more specifically in this picture the bride and groom's faces. The fact that the newlyweds figures are out of focus, increases the tension in this photograph. The earthy tones given by the brown colour palette make this a warm image, in stark contrast to the wedding day whether. Location: 60 Yorkville Ave, Toronto, ON M4W 0A4.